Fry the panner cubes in oil till it tuns light brown. Remove from the heat and drop in 1/2 cup water. Heat oil in a pan or kadhai and temper mustard seeds. Add fennel seeds, cloves, cinnamon and cardamom. Saute a while. Add chopped onions and fry for 2 mins. Add ginger-garlic paste and paneer cubes. Fry for few mins. 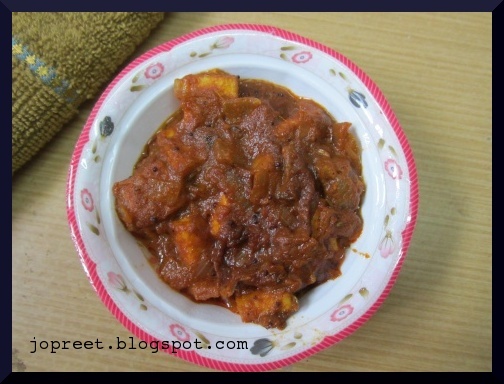 Add turmeric powder, red chili powder and tomato puree. Cook for 5 mins on low flame. Add garam masala, asofoetida, salt and 1/2 cup water. Cook till the gravy thickens and serve hot. 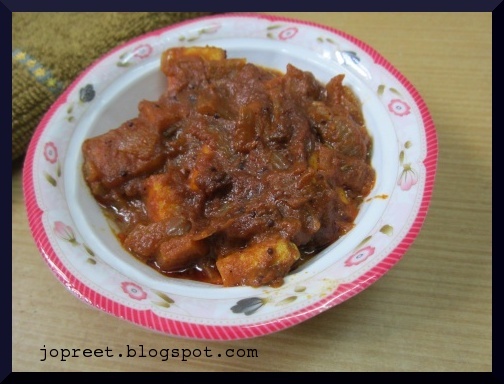 Perfect with roti / naan….Love this tangy paneer.. The gravy looks so delicious, very tempting..